Gavin Hales and Andy Higgins of the Police Effectiveness in a Changing World project team discuss the challenges of multi-agency working in a changing world and focus on some observations made from the experience of implementing the Police Foundation’s multi-agency project which tackled recurrent violence. Policing is increasingly concerned with the risks faced by the vulnerable, the threats posed by the dangerous and reducing the harm caused to the former by the latter. In response, multi-agency case management arrangements have proliferated and come to represent a ‘new orthodoxy’ for the police and their partners. However, evidence about the effectiveness of such schemes is in short supply. The Police Foundation attempted to reduce recurrent violent crime in Slough through a multi-agency case management project, as part of the Police Foundation’s Police Effectiveness in a Changing World project. An impact and process evaluation showed that although it secured strong local support, improved multi-agency working, increased information sharing and stimulated ‘sensible’ activity; it did not achieve a measurable reduction in violence. This raises a number of important questions: how can multi-agency process improvements be translated into better outputs and outcomes? Can tasking work better in a partnership setting? What can realistically be expected from these schemes? 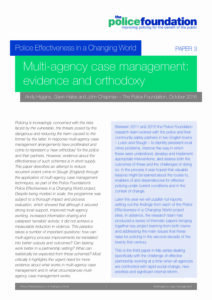 Most critically it highlights the urgent need for more evidence about what works in multi-agency case management, and in what circumstances it can be used effectively. We discussed our findings at a roundtable with third sector organisations and the police. The event offered valuable insights into how this way of working could be improved. Read a summary of the discussion.